Tara Cover, a Lehigh Valley Knights color guard member from 2003 to 2005, submitted this photograph. "This is a photo of (from left to right clockwise) Mindy, Chris (an ageout), Josh (my boyfriend and also an age out) and me, Tara. I want to share a story about how Josh and I met and how the rumor of "Tour relationships never last past a week or two after tour" is false. 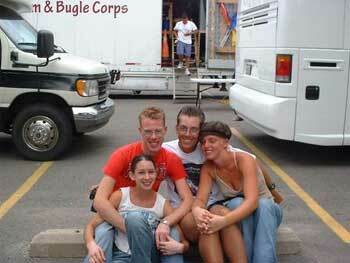 "Josh and I met in 2003 at a spring camp officially. We both knew who the other person was, he was the drum major and I was in the color guard, but never really talked or got officially introduced. So finally after a mutual friend introduced us, we began hanging out and talking. "We are not from the same area -- he is from Harrisonburg, Va., and I am from Harrisburg, Pa. However, we began to develop a very awesome friendship, and although we didn't have all the much in common, the fact that we both loved drum corps was our common bond. This alone was enough. "Over the season we became very good friends. At the end of the season it was a very hard good-bye, but we both agreed that we would keep in touch and continue to grow in our friendship. The hard thing was that I had developed feelings for him, and it was hard to say good-bye. He also had developed some feelings. However, he kept his more to himself because of his girlfriend back home in Virginia. "So over the next couple of months, during the off-season, we kept in touch through e-mail and IM conversations. When we were reunited in the fall at our first camp, it was as if no time had passed at all. He came back as the drum major and I came back to spin in the color guard once again. "Well, over the next couple of months, we continued to develop the great friendship we had, and continued to learn things about each other throughout the winter and spring months. Things between us were growing stronger each time we saw each other, and we talked more and more online and through e-mail. "He began to come up early to hang out. Things were definitely going in a direction that I had hoped for, for a long time. "However, he still had a girlfriend, in Virginia, and this was a bummer. Soon the summer months began to hit and it started to be hard to be around him. Eventually after months of thinking about what he was gonna do, he broke up with his long-term girlfriend and confided in me. We didn't start dating immediately, but eventually we did and that was towards the end of June and to this day we are still together and going very strong. Our relationship is hard, but at the same time we both agreed that we have to be able to communicate with each other. "We see each other at least once a month and talk pretty much every day. So as you can see the rumor of "Tour relationships just being tour relationships" is not always true. "You really can find true love in an activity two people love." Thanks Tara!